The youth and sports movement in the Kingdom of Bahrain witnessed a recent surge in different areas owing to the interest and guidance of His Majesty King Hamad bin Isa Al Khalifa, and to the direct attention of His Royal Highness Prince Khalifa bin Salman Al Khalifa, the Prime Minister, and His Royal Highness Prince Salman bin Hamad Al Khalifa, the Crown Prince, Deputy Commander-in-chief and the First Deputy Prime Minister. The youth and sports movement reached advanced stages internationally as a result of the strategy of His Highness Shaikh Nasser bin Hamad Al Khalifa, Representative of His Majesty the King for Charity Works and Youth Affairs, Chairman of the Supreme Council for Youth and Sports and President of Bahrain Olympic Committee, and the efforts of His Highness Shaikh Khalid bin Hamad Al Khalifa, First Deputy Chairman of the Supreme Council of Youth and Sports and President of Bahrain Athletics Association. There are 36 youth centers that provided 867 different programmes for 50000 members. The King Hamad Youth Empowerment Award to Achieve the SDGs was launched at the opening session of the United Nation’s Economic and Social Council Youth Forum at the UN headquarters in New York. The session was attended by Frederick Shava, President of the Economic and Social Council, Peter Thompson, President of the UN General Assembly’s 71st Session, and Ahmad Al Hindawi, UN Secretary-General Envoy for Youth as keynote speakers in the forum. The award reflects the leading role of the Kingdom of Bahrain in empowering youth and confirms the commitment of the Kingdom to achieve the Sustainable Development Goals (SDGs) adopted by the UNGA in 2015. This award will open up new avenues aimed at reinforcing a core principle of the UN which is “Leaving No One Behind” by creating peaceful, fair and inclusive societies. 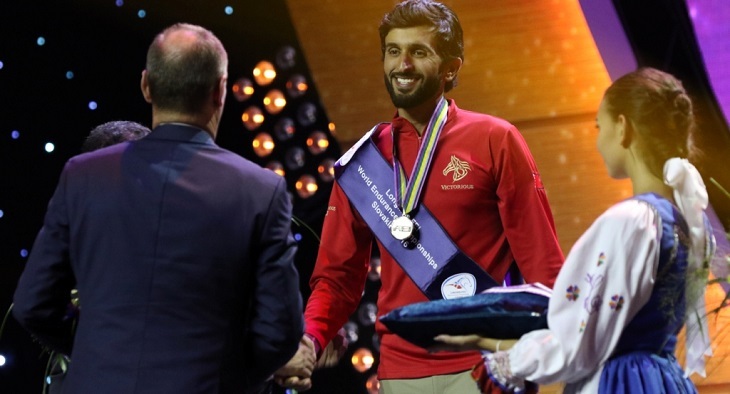 Bahraini athletes won 511 medals in 2016 which included His Highness Shaikh Nasser bin Hamad Al Khalifa’s bronze medal in the World Endurance Championship in Slovakia. Despite Mixed Martial Arts (MMA) being a fairly new sport in Bahrain, the MMA team of His Highness Shaikh Khalid bin Hamad Al Khalifa won the Bronze medal in the IMMAF World championships of Amateur MMA in Las Vegas. Bahraini runner Ruth Jebet also won the Olympic Gold medal in the 3000 meters steeplechase in Rio. Al Najma Club won second place in the Asian Handball Championship while Al Ahli Club won third place in the Gulf Clubs Handball Championship. ts The Kingdom of Bahrain continued its support to the sports and youth construction sector. Bahrain has, in recent years, constructed and built comprehensive clubs, developed sports stadiums, football pitches and multipurpose sports halls in addition to Olympic swimming pools, youth centers and youth sports grounds. The Ministry of Youth and Sports Affairs launched the 7th edition of Youth City 2030, which aims to provide vocational training for youth for entering the job market. At the initiative of the Ministry of Youth and Sports Affairs, the Council of Arab Youth Ministers agreed on the implementation of the «Arab Youth Ambassadors» project by the League of Arab States and the Ministry of Youth and Sports Affairs in the Kingdom of Bahrain. The project aims to promote the talents of Arab youth to the world. The Ministry won the rights to launch the Duke of Edinburgh’s International Award, which makes it the first government entity in the region to do so. The award represents a personal challenge to the individual, which allows them to identify their potential, capabilities and achievements. It is awarded to individuals in the age group between 14 and 25 who have realized personal achievements. The league was launched in 2013 and the participation rate reached over 100% in 2016. The award saw the participation of 660 individuals interested in theatre. In 2016, 5773 individuals from 112 countries participated in the award.